One of the effective ways to lift the curtain of the future is fortune telling. Guessing on the Tarot cards will help you to find out what awaits you in the near future in love and at work, what your state of health will be. Throughout life, we all face situations that we don’t know what to expect. Many people just out of curiosity want to know what awaits them in the future. But mostly, fortune telling is resorted to when they want to solve a pressing problem or find out which solution will be optimal. This applies to various aspects of life: someone is concerned about relationships with a person, others are interested in their material stability, and still others want to know if serious diseases are expecting them soon. 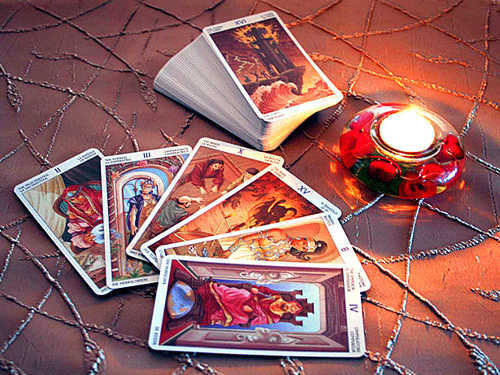 Divination for the near future on tarot cards has long enjoyed tremendous popularity. Many practices of fortune telling on cards are available, and for this you do not need to have the gift of clairvoyance. It is enough to have a deck and interpret the alignment of the drawn cards correctly. For this fortune telling, you will need older arcana tarot cards. There are 21 of them. The layout technique is as follows. Take a pack of cards, select the senior arcana, how to shuffle them. Remove once to yourself, preferably with your left hand. Then place three cards in a row in front of you, shuffle again and place another three on top of the existing row. Continue the alignment until the cards run out. Now you have in front of you three decks of 7 cards each. The left deck is responsible for love, in the middle there is a stack of cards responsible for money, and the last pile of cards is for health. The interpretation of the cards is made sequentially for each deck. Start the ritual from the left deck. Pull out one card, see the description of this card below, then the next. Thus, see the interpretation of the entire stack, which is responsible for the prediction of love. After that, the queue is a deck of cards responsible for finance. Pull out the first card, see the description, then the second, and so on, until there are no cards left in the stack. The turn of the last deck, which predicts your health in the near future. Alternately pull out the cards, referring to the designations of each card. On the day, you can make a balance several times, but note that the very first is the most correct. There are other divinations on tarot cards that you can see by clicking on the link. Jester: if this card falls, fate tells you not to repeat past mistakes. Soon you will be given a new path, the main thing is not to start walking in a circle. Mage: the card means that the decision you will make in the future will be yours; the Higher Power will help to accept it. You are ready to take the risk, and you will surely succeed. Priestess: fate tells you that it’s time to rely on intuition, listen to yourself. In the near future you should not hurry and make hasty decisions, it is important to keep sobriety of thoughts and kindness in your heart. The Empress: The card shows that everything in your life will be necessary, problems will be bypassed. However, there may be a rival or a woman, under the influence of which you will fall. The Emperor: The card indicates that you can become a leader both at work and in the family. There is an appearance soon of a strong patron who will be older than you. Priest: a card means that you will find a wise person on whom you can entrust the solution to your problems. Either you become the kind of person you turn to for advice. Lovers: Fate shows that you open your heart and love a person, surrender to the feelings, it will happen very soon. Ahead of you is waiting for a new stage of spiritual formation, whether you take advantage of it — the choice is yours. Chariot: a new life is expected in the future, relocation is possible. Fate will provide opportunities that are subject to personal change, she wants you to prove her strength in problem solving. If you manage to come — you will succeed. Justice: fate indicates that you will not be honest with yourself. In the future it is worth refusing from self-deception and accept yourself and your problems. Life will not improve if you are fixated on blaming others. Hermit: The card warns you that accuracy will be required soon, especially in love affairs. You can pull yourself together and rein in your emotions. Wheel of Fortune: the map shows that in the future in your life you expect the repetition of past mistakes, you need to be more vigilant and look at the situation from the side. If you can prevent replay, you will succeed. Strength: The card symbolizes health and success in the future. Fate wants to test your strength by sending you various temptations every now and then. It is necessary to devote all free time to affairs which postponed for later. Hanged: fate indicates your indecision in the future. The turning point will come soon, you have to focus and this time choose the right solution. Death: The card signals upcoming changes that can change your life. However, pleasant changes are waiting for you or not, depends only on your courage. Abstinence: The card means that in the future you will have a surge of positive emotions and strength. Perhaps a happy ending, but they may linger for a while. Devil: the card shows that you can be captured by temptations, feel envy and self-interest — you should abandon it so that you will not be dragged into the “abyss”. Fate wants you to achieve what you want with good intentions. Tower: The card draws your attention to the thorny path to the desired goal. In the future, the decay of vitality can happen, you will be surrounded by circumstances beyond the control of decisions. But you are able to overcome them. Star: fate shows with this card that everything that you are now striving for will be fulfilled, it is not necessary to leave everything halfway. In the near future, luck and success await you, diseases will bypass. Moon: the card symbolizes the illusion of life, in the future you may not understand that you live in your dreams. Soon you will be cheated, or you will encounter the meanness of a loved one. The sun: the card indicates material stability, happiness in love, success. In the near future, Higher Forces can reward you for past adversities, perhaps the fulfillment of treasured desires. Court: the map shows that you are on the path to restoring your life forces, energy is seething in you. Your longing wish will come true soon. World: This card indicates a happy outcome of all things in the future and in all directions. You are required to find your place in life and relationships without help. Today Tarot Divination «> tarot cards fortune-telling is an open-source way to find out what awaits you in the near future. With the help of such a ritual, people have long been looking into the future. And this is not surprising, since fortune-telling helps solve many complicated situations in life, warns about sad future events and helps to prevent them. This unique way of divination for the future is perfect for all people. It does not require a deep understanding and study of each card. Even if you do not have the experience of conducting such rituals, you should not worry: the given alignment is simple and understandable for everyone and has the power to lift the veil of secrecy.